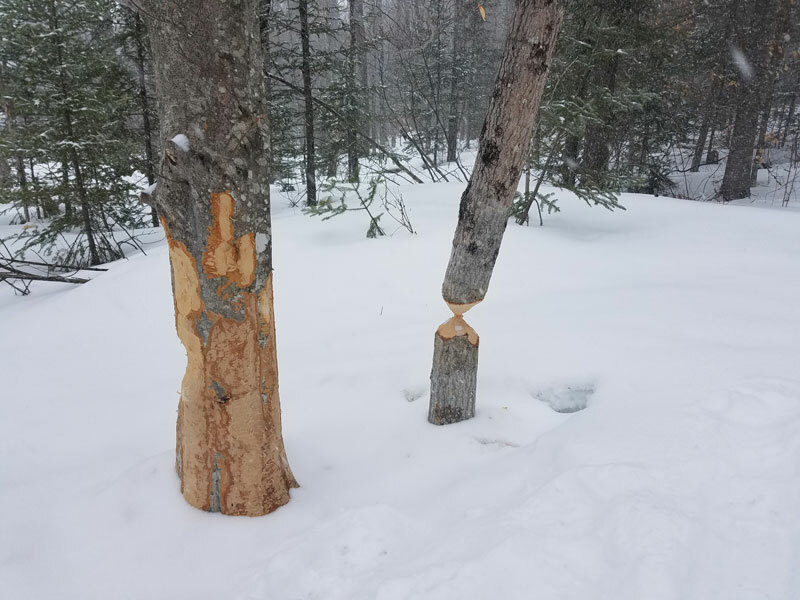 Beavers on Brown Brook Trail getting spring work done. Trails are very soft due to warm temperatures this week. Expect spring like riding with waterbars and hazards developing. News is not great for our trails but more snow is expected this weekend. The trails have 80 % snow cover, 15 % ice and 5% dirt. Moderate springlike conditions. Groomers are working. These pictures are the worst areas. Despite some warm temperatures in the forecast, we have plenty of snow and a hard base to keep the riding great this weekend. Hopefully things will get colder next week. 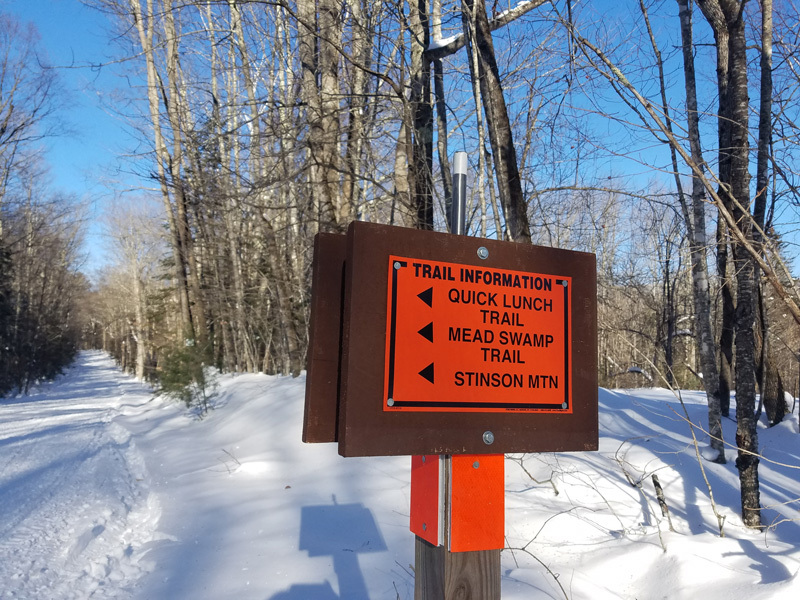 NEW TRAIL SIGNS. Thanks to Brian at Planet Graphics in Pembroke MA. for donating the vinyl letters for our trail signs. Check them out on the trails this weekend. Our trails are in good shape considering what we have had to deal with the last two weeks. 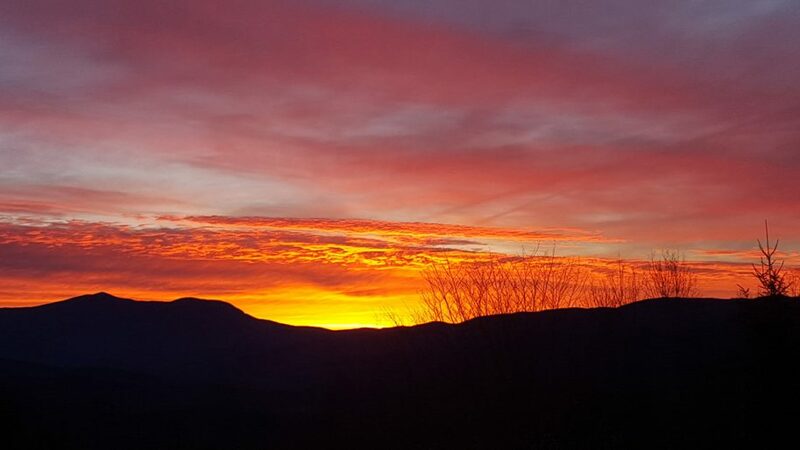 All our major trails are groomed and have full cover with the exception of Stinson Mtn which is closed due to ice and storm damage and Lower Doe Town is closed. Hope to see you all at the Warming Hut Saturday. This week’s rain brought ice to the trails. The trails are smooth but icy in some locations. Stinson Lake is all ice. Grooming continues but we could use some new snow. 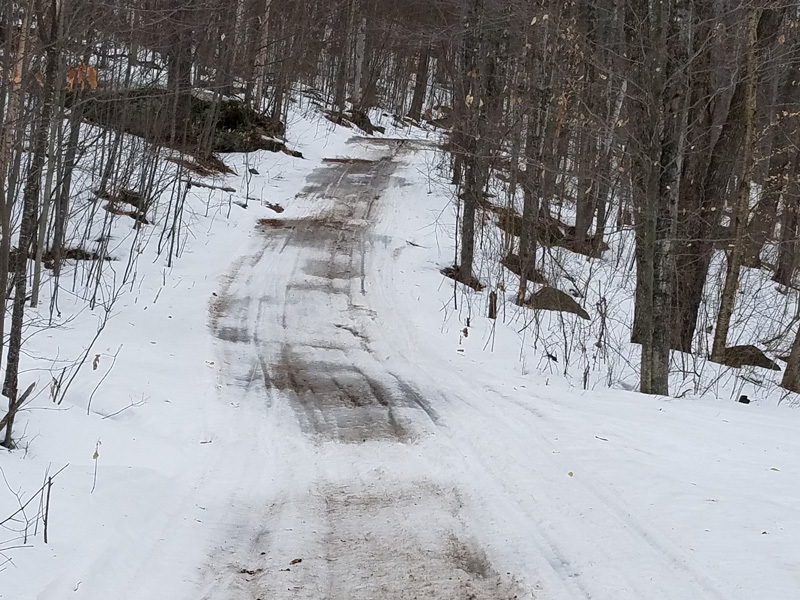 Well the heavy rains that covered all of New Hampshire last weekend certainly melted a lot of snow but our trails survived and grooming resumed on Monday. The hard crust was broken up and most of the water damaged sections were filled in. There are still some open water bars. USE CAUTION. Today we received 3-4 inches of new snow which will help. This weekends forecast looks promising for some great riding. 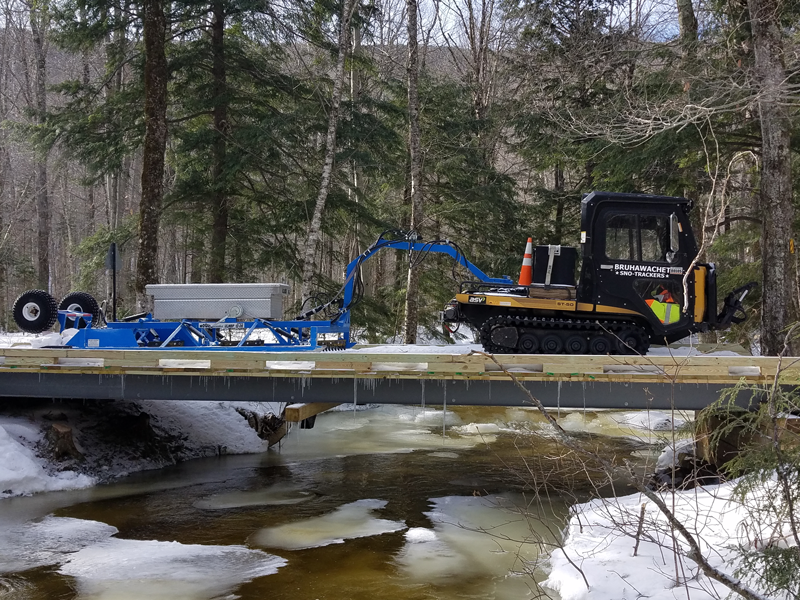 Check out our groomer on the rebuilt Three Ponds Bridge. 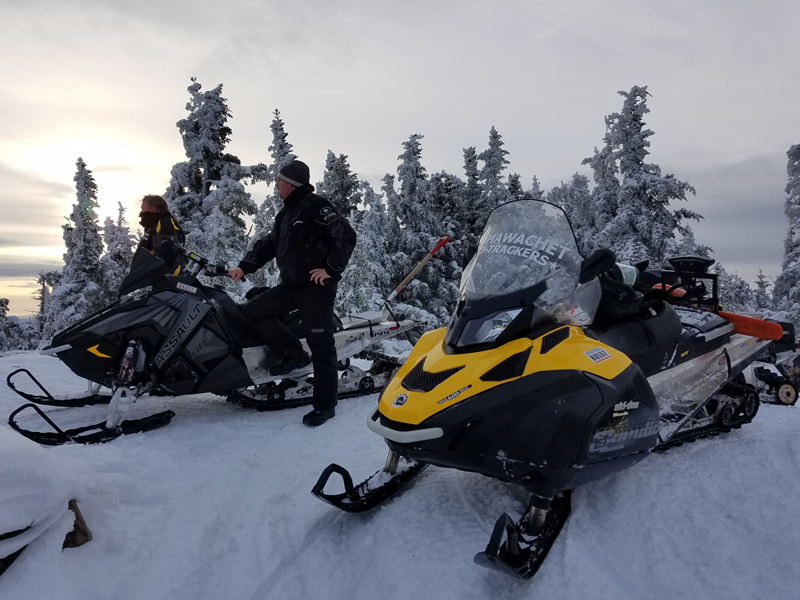 As old man winter bears down on New Hampshire with bone-chilling cold air and snow, the grooming team continues to prep the trails and groom whenever we can. Most all our trails have been groomed and compacted. We have lots of snow to work with so as temps get back to normal we should have the best riding in years. See pic of Top of Stinson Mtn. We are off to a great start to our winter season with over 2 feet of snow and frigid temperatures to freeze up any wet spots. The groomers have been serviced and will be working the trails this week. Our last work day was Wednesday. A badly needed bridge was added to North Trail and a washed out bridge on Brown Brook Trail was relocated. See video. Hope to see you on the trails.